Basic summary of events, quotes, articles of the time, suggested readings and pictures. Quotes. Hitler, Ataturk, US Ambassador, etc. Wilsonian Armenia - The agreed upon settlement. Articles in major western newpapers. Short Texts about the genocide. Declarations of Recognition of the Armenian Genocide. Suggested Readings. Order books on-line! How to link your web page to this one by adding the flames to your page. Reynold Khachatourian's excellent Armenian Genocide Page. For an excellent summary of Armenian history prior to the genocide, you can visit Papazian's Armenian History Brief.. Somewhat surprisingly to many, Armenians and Turks lived in relative harmony in the Ottoman empire for centuries. Armenians were known as the "loyal millet". During these times, although Armenians were not equal and had to put up with certain special hardships, they were pretty well accepted and there was no real conflict. Things began to change for a number of reasons. Nationalism, a new force in the world reared its head and made ethnic groupings self-conscious, and the Ottoman Empire began to crumble. It became known as "the sick man of Europe" and the only thing holding it together really was the European powers lack of agreement on how to split it up. As other Christian minorities gained their independence one by one, the Armenians became more isolated as the only major Christian minority. Armenians and Turks began to have conflicting dreams of the future. Some Armenians began to call for independence like the Greeks and others had already recieved, while some Turks began to envision a new Pan-Turkic empire spreading all the way to Turkic speaking parts of Central Asia. Armenians were the only ethnic group in between these two major pockets of Turkish speakers and the nationalist Turks wanted to get rid of them altogether. As European powers began to ask for assurances that Armenians recieve better treatment, the government began to treat the Armenians worse and worse. In the 1890's hundreds of thousands of Armenians died in pogroms ordered by Sultan Abdul Hamid II. A coup by progressive Young Turks in 1908 (I think) replacing the Sultans government was supported by Armenians. Unfortunatley, promised reforms never came and in fact a triumpherate of extreme Turkish nationalists took complete dictatorial control. Enver, Jemal and Talat. It was they who masterminded the plan to completely eradicate the Armenian race in a step towards fulfilling their pan-Turkic dreams. World War one gave the Young Turk government the cover and the excuse to carry out their plan. The plan was simple and its goal was clear. On April 24th 1915, commemorated worldwide by Armenians as Genocide Memorial Day, hundreds of Armenian leaders were murdered in Istambul after being summoned and gathered. The now leaderless Armenian people were to follow. Across the Ottoman Empire (with the exception of Constantinople and Adana, presumably due to a large foreign presence) the same events transpired from village to village, from province to province. The remarkable thing about the following events is the virtually complete cooperation of the Armenians. For a number of reasons they did not know what was planned for them and went along with "their" governments plan to "relocate them for their own good". First the Armenians were asked to turn in hunting weapons for the war effort. Communities were often given quotas and would have to buy additional weapons from Turks to meet their quota. Later, the government would claim these weapons were proof that Armenians were about to rebel. The able bodied men were then "drafted" to help in the wartime effort. These men were either immediately killed or were worked to death. Now the villages and towns, with only women, children and elderly left were systematically emptied. The remaining residents would be told to gather for a temporary relocation. To only bring what they could carry. The Armenians, again obediently followed instructions and were "escorted" by Turkish Gendarmes in death marches. After the war ended, the Turkish government held trials aver the genocide and found the triumpherate guilty in abstentia. All three were later executed by Armenians if I am not mistaken. Turkey agreed to let the US draw the border between the newly born Republic of Armenia and the Turkish government. What is now called Wilsonian Armenia included most of the six western Ottoman provinces as well as a large coastline on the Black sea. Cilicia, a seperate Armenian region on the Mediteranean was to be a French mandate. Mustafa Kemals forces pushed the newly returned Armenian refugees and forces from these lands and forced a new treaty to be written which was an insult to Armenian victims. They were basically told to never return and they would never recieve compensation. The Kars and Ardahan provinces of Armenia were taken on top of that in an agreement with the Soviet Union. The Turkish government has in the past few decades been denying that a genocide ever occured and spending millions of dollars to further that view. This is adding insult to injury and will cause bad feelings to continue much longer than would otherwise be the case between the peoples. Those who say forget about it, it is in the past are wrong. Unless crimes like this are faced up to and compensated, they will be commited again and again by people who do not fear prosecution or justice. Read what Hitler said before beginning the Jewish Holocaust here. 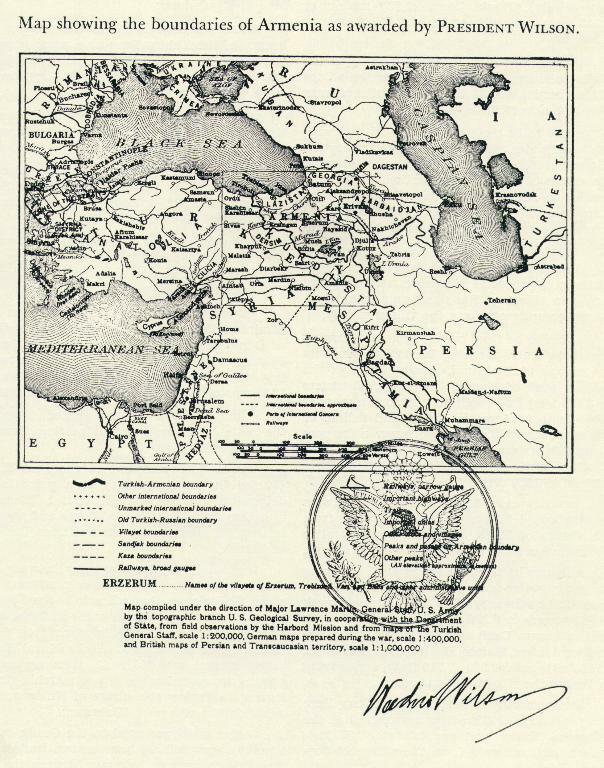 This is a map of Armenia's border with Turkey drawn by U.S. President Wilson as requested by the League of Nations, according to the terms of the Treaty of Sevres.